In contrast with the 2008 presidential campaign, moments in which either of the candidates was challenged on his religious identity, or forced to defend a controversial religious position, were muted and short-lived. Among the incidents that rose to the surface, at least momentarily, was when a Baptist minister from Texas described Romney’s Mormon faith as a cult. The Rev. Robert Jeffress made the comments at the October 2011 Values Voter Summit in Washington, D.C., as he was introducing Rick Perry. Romney responded only briefly to the comments – "I just don’t believe that that kind of divisiveness based on religion has a place in this country," he said – and the story faded after about a week, amounting to 5% of all religion coverage during the period studied. Another modest flurry of religion coverage began in January 2012 when the Obama administration announced that most health insurance plans must cover women’s contraception, provoking criticism from some religious institutions and leaders. These critics included the U.S. Conference of Catholic Bishops, which described the legislation as a threat to religious freedom. The ensuing debate became a campaign issue as GOP candidates, including Romney, challenged Obama – a rare instance in 2012 in which the candidates themselves initiated faith-related news. 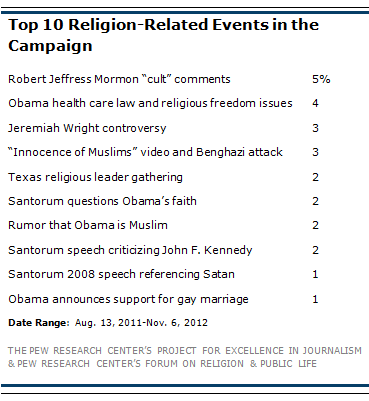 Yet it accounted for just 4% of all religion-related coverage in the campaign. Other religion-related events that garnered media coverage in the 2012 campaign included a recycling of the Rev. Wright controversy from four years earlier, a YouTube video about the Islamic Prophet Muhammad that sparked protests in several countries, a gathering in Texas of prominent evangelical leaders to decide which candidate to support, and continuing allegations or rumors that Obama is a Muslim.